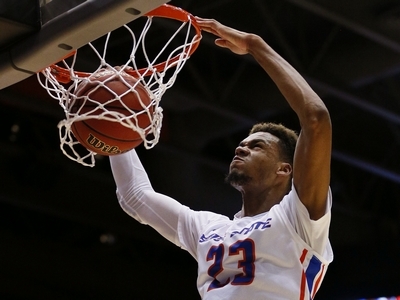 Jacob breaks down James Webb III, a 6-9 sophomore forward for the Boise State Broncos. James Webb III came out of nowhere last season to become a focal point on both ends of the floor for the upstart Boise State Broncos, who surprised many by tying San Diego State for first in the MWC. A late bloomer who didn’t garner much attention in high school, Webb eventually played a year of JuCo at North Idaho in order to fulfill his academic requirements before enrolling at Boise State last fall. In his first season with the Broncos, Webb established himself as an elite-level role-player, averaging 15.7 points and 11.2 rebounds per-40 minutes – en route to winning the Mountain West’s Newcomer of the Year Award. At 6’9 and with a 6’10.5 wingspan, Webb certainly possesses the height and length to play forward in the NBA. He’s quite wiry, weighing around 200 pounds, but he possesses an advanced rebounding aptitude for someone his build. In fact, Webb’s calling card as an NBA prospect is his unique combination of athleticism, strong rebounding, budding perimeter shooting, and encouraging defensive potential, even if his frame is something teams will want to see continue to improve as time moves on. Webb pulled down 11.2 rebounds per-40 minutes in his first season in D1, but even that rate fails to explain just how adept he is on the boards. He grabbed 26.9% of all available defensive rebounds as a freshman – the second highest rate in DX’s top 100 prospects database. Offensively, Webb was often asked to stray out onto the perimeter as a floor spacer, mitigating what may have been a similarly impressive offensive rebounding rate. Webb is a tremendous athlete, able to get off the floor quickly and effortlessly, resulting in a number of highlight reel plays last season. Webb thrives on put-backs opportunities, simply because he can jump twice in the same amount of time it takes opponents to jump once. He combines elite athleticism with a terrific motor, as he’s constantly battling in the paint for loose balls, despite not possessing a very strong frame. Webb’s offensive potential is intriguing. He made 45-of-110 (40.9%) three point attempts last season, proving he has the confidence and touch to score consistently from the perimeter. He’s not the smoothest player on the offensive end, lacking the ball-handling skills needed at this point to do much off the dribble against a set defense. While he shot a very high percentage last season, his mechanics could use some tinkering, as he has a tendency to get streaky at times. After starting the season shooting 30/61 from 3-point range in the first 19 games of the season (49%), he finished shooting just 15/49 (31%) in the last 11 games. Webb shoots a bit of a slingshot type jumper, contorting his body sideways and shooting off the side of his hand at times, which is somewhat of a concern projecting out to the longer NBA 3-point line. He doesn’t always get the same elevation on every attempt, and is strictly a stand-still shooter at this point, with almost all of his jumpers coming with his feet set last year. While there is a lot to like about the way Webb shot the ball in his breakout season last year, teams will want to see another year of consistent shooting to gain a larger sample size and eliminate any potential flukiness. Webb was rarely asked to create much for himself or others off the dribble last season, with his usage rate ranking just fifth on Boise State last year. He averaged just 0.8 assists per-40 minutes last season, including a paltry 4.3% assist rate – one of the worst percentages among prospects in DX’s database. He’s not particularly turnover prone (just 1.3 turnovers per-40) but as someone who projects to play at least some minutes on the wing at times, scouts would like to see a little more ability to create off the dribble. Boise State may need him to do that this year with senior leader Derrick Marks off to the pro ranks, so it will be interesting to see whether Webb can handle a bigger role offensively. Defensively, Webb was inconsistent at times, but has all the physical tools to improve tremendously. Last season, Webb’s defensive flaws were mostly due to his lack of experience and strength, and certainly not due to a lack of effort. He’d lose focus on rotations and often over-pursue on double teams, allowing his man to get off clean looks from the perimeter. As expected, he gets bullied on drives and in the post against stronger players, which is a concern if asked to spend time at the power forward spot like he often is at the college ranks. Often ceding at least 30 pounds to his matchup, Webb allows deep seals and would benefit greatly by adding weight to his lower body and core. He uses his length conservatively to disrupt opponents’ looks but he’s not particularly foul prone, which is a pleasant surprise considering how often he’s challenged in the paint. On the perimeter, he isn’t always as disciplined as you may hope. He’s inconsistent with his stance and his footwork laterally isn’t refined. He can use his length to catch up in certain cases but he will need to improve his mechanics to improve balance when he’s matched up against faster and stronger players at the next level. With that being said, the length and quickness will always be an impressive foundational asset for his defense. Overall, Webb’s unique skill-set will catch the attention from NBA teams. He has potential to be a two-way player with enough length and perimeter shooting to play multiple positions at the next level. He will need to add significant weight to his frame and show his perimeter shooting is for real while playing a bigger role than he did as an anonymous redshirt sophomore. Nonetheless, with his combination of size, athleticism, competitiveness and budding skill-level, Webb’s future certainly looks promising.